﻿More and more, blockchain is becoming a buzzword. Years ago it was associated with the instability of bitcoin and other cryptocurrencies. Today farmers and agribusinesses are realizing it could be the business tool for the future. According to experts speaking at an educational session at Commodity Classic in Orlando, Florida, the biggest obstacle for agriculture's entry into the blockchain is leaving the pencil and paper behind. "Agriculture is one of the least digitized sectors," Mark Pryor, chairman and CEO of The Seam, told the crowd. "That presents a real challenge. We also have data silos that benefit only one company." But Pryor said that every once in a while a technology comes along that revolutionizes the system. He believes blockchains are that technology. Simply put, a blockchain is an openly distributed ledger that can record transactions between two parties efficiently and in a verifiable and permanent way. "A blockchain provides the single version of the truth between multiple competing parties in the supply chain," Pryor said. A blockchain has multiple characteristics. They are rules-based, distributed in real-time, permissioned and can’t be changed. But before massive adoption can take place, some hurdles have to be overcome. Pryor illustrated that among individuals and companies, the basic terminology of farming could be different. As an example, in the shipping industry one company may call a ship a vessel. Another company may call it a boat or a conveyance and on and on. "We are starting to see ADM, Bungee, Cargill and Dreyfus form a partnership that investigates standardizing and digitizing global agriculture transactions," Pryor said. "They have recognized they aren't speaking the same language." For blockchains to work, the terminology has to be defined and agreed upon by all parties involved. Pryor said it is leading to "coopetition" or collaboration between business competitors for mutual and beneficial results. What does all this mean for individual farming operations? It improves accuracy, transparency, efficiency and trust. Those factors can help farmers navigate and negotiate the narrow margins that exist in farming today, according to the panelists. "With razor-thin margins, we need to figure out how to enhance our marketing opportunities," Macias said. "How do we market our products the way we deserve and use the empowerment of data to make more money?" To do that, Marcias started Grainchain, a company built from the blockchain platform utilizing suites of software products designed to increase efficiencies for farmers. "We are providing the technology to level the playing field for the small-to medium-size farmer to be able to compete at the levels that ADM, Bungee, Cargill and others do," he said. Macias said Grainchain provides the farmer two distinct advantages: It gives them the ability to market grain so they can negotiate a better price, and it creates a system that allows them to trust others from around the world with their paid contracts. The person buying farmers’ grain will know precisely where it came from, how it was put together and the path it took to get to them. "We've developed a system that will pay you instantly when you drop your grain off," Macias said. He told the group that with complete trust in the blockchain, farmers will be more open to accepting contracts outside of their normal trading areas that may offer better premiums. "Once you get used to that, you can venture out into markets that you never would've have considered before," Macias said. "This technology ensures the funds are there when you drop off your grain, directly to your bank account without the fear of the other party backing out of the contract." Blockchains are only as good as the information entered, according to experts. Macias said individual entry of data needs to be removed. Systems are already in place to grade and measure grain. That data will be added to the blockchain for each transaction. "The combination of our systems creates an environment where nearly 99 percent of data is entered by systems and not people," he said. He told the group that the final piece of their software suite manages the trucks going to farmers’ fields, tracking where they went and what they picked up. This provides an authentic dataset that genuinely shows where it came from. That data is used to pay the truck driver for the route taken and the cost of maintaining the fleet of trucks used to transport the products. "At the end of the day we have an infrastructure that changes the way we are doing business," he said. "We've got customers right now that are going from the field all the way to the end producers. So when that tortilla chip goes in your mouth, you can authentically know where it came from." According to Grainchain's website, they have already logged 84,410 transactions with more than 5,264,205,815 pounds of commodities processed. In the future, blockchains will also have implications in food safety traceability, identity preservation, certification of sustainability practices and more. I guess you could call it a "heat wave." After dealing with double-digit subzero temperatures for four days, you would think 8 degrees felt balmy. Originally published for the Iowa Food & Family Project. Find out more at Iowa Food and Family Project. United States Ambassador Terry Branstad received a standing ovation from Iowa's agricultural groups as he entered a meeting room at the U.S. Embassy in Beijing Tuesday. It was the first event in a historic week of meetings during the all-Iowa agriculture trade mission: one that marks the first time all of the state’s commodity groups have traveled overseas together. The purpose of the trip is to enhance relationships and create new ones between the people of China and Iowa farmers, agricultural groups and elected leaders. "Welcome to the American Embassy. We are excited to have you here," Branstad told the farmers and agriculture representatives at the start of the meeting. He said that it had been a busy three weeks in his new position with deep dives into a wide range of information relating to China. Branstad was flanked by the heads of the major departments at the Embassy including Defense, public affairs, agriculture affairs, commercial affairs and political affairs. While his position as Ambassador offers new opportunities, Branstad won't forget the tactics that made him successful and led to being the nation’s longest-serving governor. He plans to continue the Iowa tradition of visiting every county in the state annually by visiting all of China's regions while conducting meetings with high-ranking government officials. Governor Reynolds, the head of the all-Iowa agriculture trade mission, thanked the Ambassador for the historic meeting. "Relationships are especially important in China, and we are fortunate that Governor Branstad welcomed a then-local agricultural official from China over 30 years ago into Iowa named Xi Jinping who is now the nation's president," Reynolds said earlier in the week during tours in Shanghai and Xi'an. Those relationships have now been enriched and extended with Branstad's new role as U.S. Ambassador. "It doesn't escape Ambassador Branstad of how important it is that all of the Iowa agriculture groups are here in China," Rolland Schnell, president of the Iowa Soybean Association, said. "We are here as one unit and Branstad recognizes how important that is to Iowa’s economy." The delegation hopes to further solidify with the leaders of China that we are partners in meeting mutual goals in food security, safety and sustainability. China's investment in the United States has now surpassed U.S. investment in China. Food consumption in China is expected to grow 25 percent from 2015 to 2020. China doesn't want to be reliant on any one country for goods, but U.S. soybeans are an exception. The U.S. has over $450 billion in investments in China. China is pursuing an initiative to increase manufacturing of its own agricultural machinery. A top priority in China is to be more environmentally friendly. One question from the Iowa delegation pertained to trade and what some would consider political instability in Washington, D.C. Ambassador Branstad assured the group that trade between the U.S. and China would continue to grow. That was good news for all members of the Iowa delegation; especially for those members growing and representing soybeans. China is by far the largest soybean importer in the world and is projected at 83 million metric tons, or a little more than 3 billion bushels. The U.S. markets nearly 1.1 billion bushels annually. Branstad told the group that during meetings with President Trump last week in Washington, D.C. he presented a plan to bring top business leaders to China to discuss trade barriers and possibly sign contracts. Soybeans, of which Iowa often leads the nation in production of, are a primary feed ingredient for pigs. China, which wasn’t in the market for soybeans 15 years ago, currently accounts for 60 percent of global soybean imports – and growing. One of every four rows of soybeans grown in Iowa is destined for China. It is apparent that Branstad still intends to champion Iowa agriculture in his new position, telling the leaders gathered that he hopes to get more U.S. products into the embassy and China. "I met with Tom Vilsack (currently president and CEO of the US Dairy Export Council) to talk about the vague rules concerning dairy imports into China. The milk we drink in the Embassy is from Australia," He said. 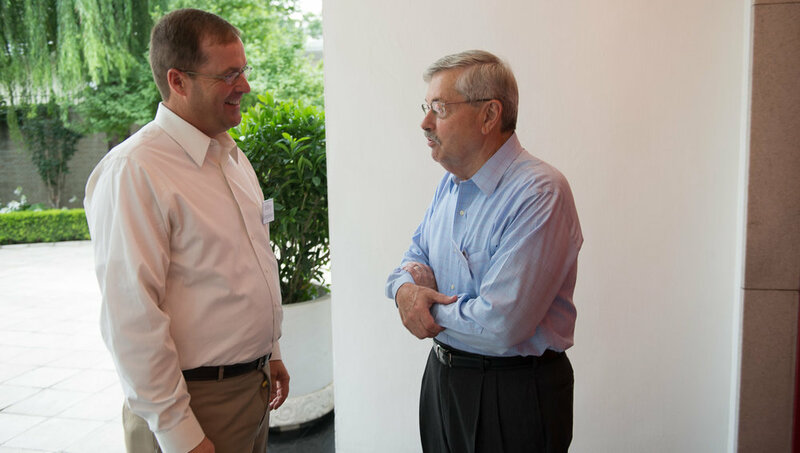 "I'd like to see it come from the U.S."
Schnell was honored to have the opportunity to visit with Ambassador Branstad in his new role in China. “It is overwhelming when you step back and think about it,” Schnell said about meeting with a U.S. Ambassador in China. “Most farmers don’t get an opportunity to do this; to be there and see all the things that are going on at the ground level, all the work that is being done to support agriculture. I don’t think the general farming public realizes what is involved and what it takes to make the excellent trade programs we have and how they translate into dollars in farmers’ pockets." I’ve been trying my hand at cooking lately and found that many recipes I make require milk. It wasn’t until a recent visit to a dairy farm that I discovered milk has its own ingredient list. Items like Hay, corn, soybean meal and silage are the ingredients that help to make delicious and nutritious milk. What happens when those ingredients dry up? Those ingredients, or feed supplies, are becoming harder and harder to find as the drought conditions expand across the country. Ingredients like corn, alfalfa, cottonseed and hay have been impacted by the dry weather so availability is becoming less and less. Kelley Cunningham stands by his dairy herd near Atlantic, Iowa. Drought conditions have impacted all areas of agriculture across the Midwest. It would seem, for dairy farmers across the country, that possession truly is nine-tenths of the law these days. As the drought ruins more and more of the crops, possessing the hay used for feed becomes exceedingly significant in protecting it from other buyers wanting to purchase it for a higher price. Cunningham manages a dairy farm that has 3400 cows. The cows produce milk in comfort on sand beds and in tunnel ventilated buildings. Those practices help keep the cows comfortable year round. There are 33 employees at the dairy but Cunningham is quick to point out that, for every employee, there are 15 other jobs tied to the farm in the area. Currently businesses like Anderson Erickson pay around $18 per hundred weight of milk. That number has shrunk from last years price of $23 per hundred weight. Combine that decrease with an increase in feed costs due to the drought and that is a recipe for troubled times. Cunningham went on to say that the future price for milk is expected to go up over the next three months so that should give them some relief. The duration of the drought has Cunningham worried about feed supplies for next year and beyond. At those prices, Cunningham will need milk prices to be at $20 or $21 per hundred weight to break even. Alternative feeds have been one way of closing the feed cost gap for his dairy. Ingredients like Molasses, beet pulp, and cottonseed have helped to supplement the diets of the cows while using less of the expensive commodities like corn and hard to find ingredients like hay. Cunningham went on to say that the costs that they are paying for feed ingredients will raise the cost of ingredients in the food that we eat. So next year the gallon of milk pulled from the cooler at the grocery store could cost you 20 percent more. Originally published for the Iowa Soybean Association.